We travel a lot in Asia lately and markets, by night or floating, are one of the main things to visit if you wanna understand the locals and the culture. But what’s “Asian cuisine”? For us, the term refers to the foods from a region that is home to more than half the world’s population. Within this wide swath are cooking traditions from East Asia (China, Japan, Korea), Southeast Asia (Thailand, Vietnam, Malaysia), and South Asia (India, Pakistan). Because of the term’s vast geographic mass, ingredients used from region to region can be mind-boggingly similar—and varied. 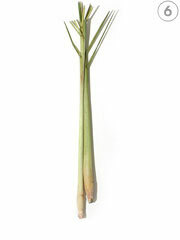 For instance, lemongrass, predominant in Southeast Asian cooking, isn’t used in East Asian cuisines, but ginger is used throughout the continent. Most of these foods can be found in Asian markets. Online sources include ImportFood.com and Melissa’s. And if you’d like to try growing your own, visit a local garden nursery or an online seed supplier like EvergreenSeeds.com. 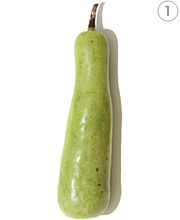 Characteristics: This long, smooth-skinned gourd has a mild taste somewhat reminiscent of zucchini. Immature, the flesh is sweet, but it turns more bitter as it ages. Wait too long, and it will dry out and become hollow. This squash may have originated in Africa but it is used in European and Southeast Asian cooking in traditional dishes such as the Vietnamese soup canh bau tom and the Italian cunigghiu (salted cod fish), which relies on dried cucuzza. If you can’t find opo squash, use zucchini. Characteristics: Native to Malaysia, this rough-textured, hairy brown tuber is used in cuisines as varied as Polynesian and Indian. 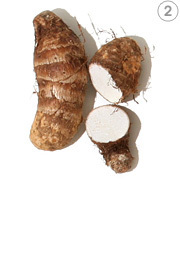 (A close relative, the yautia, is found in African and Caribbean cuisines and is treated like a potato.) Its flavor is somewhat nondescript and bland, making it the perfect conduit for strong flavors. In Hawaii, taro is used to make traditional poi, a gelatinous dish made from steaming and pounding the root into a pulp. In Indian cooking, slices of taro root are seasoned with spices and then fried. And although taro is consumed throughout the year in Chinese cuisine (you can find taro cakes at dim sum), it is especially popular during the Lunar New Year’s celebrations, when you can find taro-filled moon cakes. Characteristics: Looking at the beautiful lotus flower floating on the water, you might be surprised to find out that the “roots” are also edible (technically the flower’s stem). 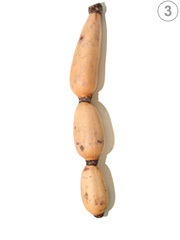 The lotus root looks like a chain of giant pods connected to one another. Crunchy, with a tinge of sweetness, the vegetable can be prepared in a variety of ways—fried, sautéed, steamed, boiled—without losing its firmness, making it an ideal snappy texture for dishes such as salads. Although used throughout Asia, the lotus root is closely associated with Chinese cuisine. It is also prized for its unique interior pattern of holes, which add a decorative aspect to a dish. 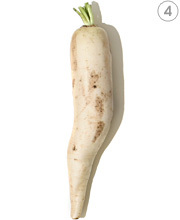 Characteristics: This large radish resembles an overgrown carrot that lost its orange coloring. 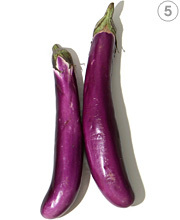 As with any radish—Asian or European—it should be free of blemishes and not soft and pliable. In Korea, cubed daikon radish is used to make a type of kimchi. Its mild taste makes it an excellent palate cleanser. In Japan, strings of daikon marinated in vinegar typically accompany sashimi. Try serving the radish in light salads where its own flavor won’t be overwhelmed by the other ingredients. 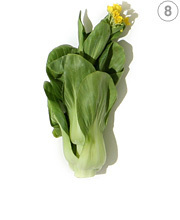 Characteristics: This cabbage has a soft, more wrinkled texture than other types. 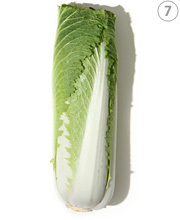 Because it has a less bitter taste than some varieties, the napa cabbage easily adopts strongly flavored marinades and sauces. The leaves, which are densely packed, should be a grassy-green hue and have a bright white stalk center, with no brown spots or blemishes. In East Asia, the cabbage’s leaves are used in soups and stir-fries; it is also a main ingredient in Korean’s unofficial national dish, kimchi. Characteristics: With deep grooves and a bumpy texture, this green melon is unlike most melons known in the Western hemisphere. 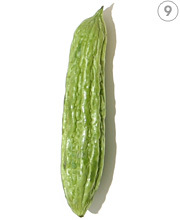 If eaten in an unripe state, it lives up to its name. Allow it to ripen, though, and the interior gains a lovely reddish hue and it has a sweeter flavor. Grown in tropical regions throughout the world, the melon’s bitterness (due to small amounts of quinine) is an acquired taste. 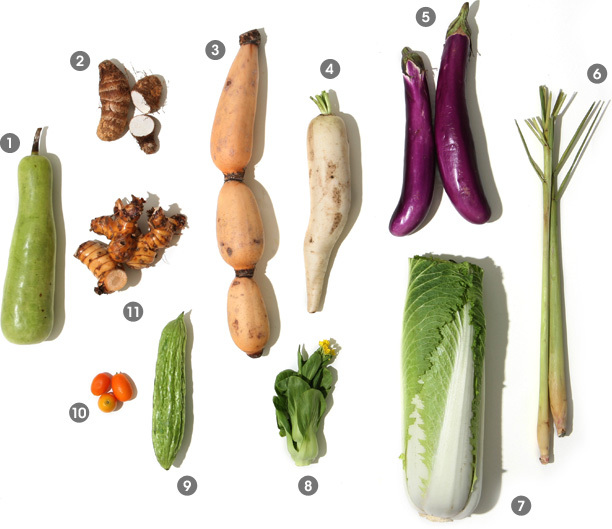 If you cook it, treat it as you would a zucchini, and then try making pinakbet, a traditional Filipino dish that includes vegetables such bitter melon, eggplant, tomatoes, okra, and string beans. 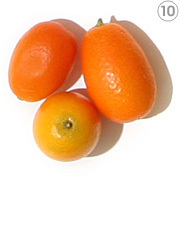 Characteristics: Originating in China, kumquats are the smallest citrus fruits in the world. Grape-sized, they pack an intense flavor that is both sweet and sour, with a surprising twist in that the skin is sweeter than the pulp. The fruit is consumed in its entirety, skin and all, but can also be preserved, candied, or pickled. Because of their size, kumquats are typically eaten and served whole, and make for a lovely visual asset. They’re a popular treat during the Chinese New Year, symbolizing prosperity and unity. Serve kumquats in a salad or use them to flavor savory foods like meat and poultry, as well as in cocktails. Try substituting kumquats for lime. Characteristics: Galangal’s shape is similar to that of ginger, but it has a distinct ringed red-orange-brown-colored skin that feels waxy. Its interior is white but turns brown when exposed to the air. 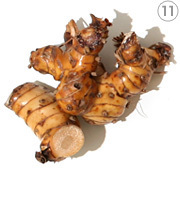 Tastewise, galangal is more spicy-peppery-pungent than ginger. Cook it as you would ginger—minced, sliced, grated, ground up—and use as flavoring. Galangal is used throughout Southeast Asia in such dishes as Indonesian fried rice (nasi goreng), Malaysian rendang (a currylike meat or poultry dish), and Thai curries.